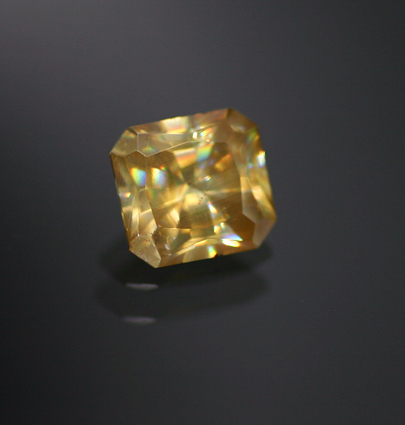 A magnificent example of this rarely faceted gem material. Wulfenite is a lead mineral that has exceedingly high optical properties so, if done correctly, faceted gems are capable of dazzling brilliance and impressive dispersion. This one is something of a fireball, the light tone of the color allows for flashes of color across the spectrum. The color is nicely consistent and the stone looks great with flashes of dispersion from all angles. Gorgeous custom US cutting and a fine high polish. A very fine Wulfenite.